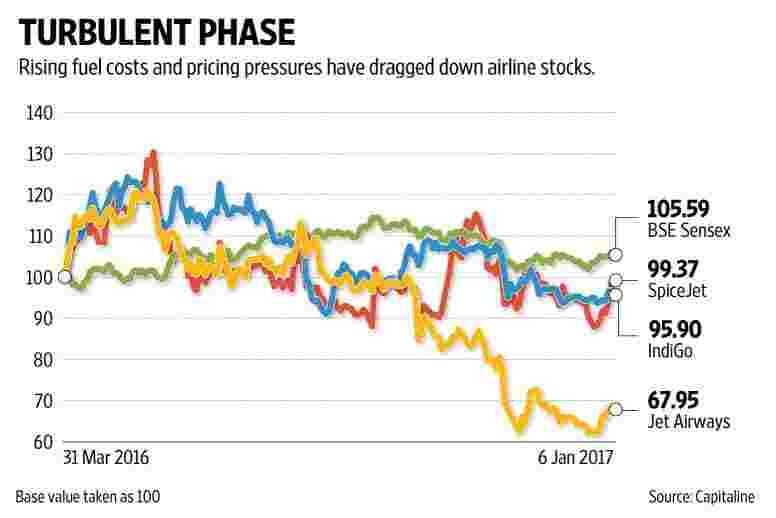 So far this fiscal year, the performance of aviation stocks—InterGlobe Aviation Ltd (IndiGo), Jet Airways (India) Ltd and SpiceJet Ltd—has hardly taken off. All the three stocks have underperformed the benchmark Sensex. That is despite the fact that these firms reported profits for the half year ended September (H1FY17). Unfortunately, with crude oil prices firming up, the flight is set to get even more turbulent. Data from Indian Oil Corp. Ltd shows aviation fuel prices in Delhi increased 32% from 1 January 2016 to 1 January 2017. But that’s just one part of the problem. The other critical part is that there are pricing pressures. As ICRA Ltd pointed out in a report last month, during H1FY17, while passenger traffic on Indian airlines increased 20.2% and average jet fuel price declined 1.3% (versus FY16), yields (revenue per unit) have reduced by 2.5% to 11.6% across the three listed airlines. Sure, volumes have continued to be robust, and that is good news. On a year-on-year basis, passengers carried by domestic airlines increased more than 20% for October and November, according to the Directorate General of Civil Aviation. The fact that November has been a good month indicates that demonetization did not cast its dark shadow on traffic growth. What’s more, Sharat Dhall, chief operating officer (B2C), Yatra.com, says demonetization hasn’t affected traffic growth, and the month of December, too, was business as usual. That’s good news but doesn’t call for a celebration yet. Here’s why: Yatra.com (an online travel firm) data shows average fares for the December quarter on indicative sectors—Delhi-Bengaluru and Mumbai-Delhi—have declined 16% and 6.7%, respectively, on a year-on-year basis. Kolkata-Guwahati and Chennai-Thiruvananthapuram average fares have declined 21.6% and 16.5%, respectively. Against that backdrop, it will be interesting to watch how profit margins and yields of all three companies behave in the December quarter. Expectations aren’t rosy. Kotak Institutional Equities anticipates IndiGo’s Ebitdar margin to decline 320 basis points year-on-year as the firm absorbed a hike in fuel costs. Ebitdar is earnings before interest, taxes, depreciation, amortization and aircraft rentals and is a key profitability measure for airlines. One basis point is one-hundredth of a percentage point. Edelweiss Securities Ltd expects Ebitdar of all the three firms to decline on a year-on-year basis, with Jet Airways registering a sharper drop in the measure than the other two firms. Simply put, the double whammy of higher crude prices and pricing pressures is likely to keep aviation stocks from flying too high.